That's a native refresh rate, folks. Asus teased in late September of last year that it was prepping a 24.5-inch monitor with a fast 240Hz refresh rate for an early 2017 release, the ROG Swift PG258Q. Staying true to its word, Asus formally announced the nifty monitor today, saying it will come to market in February. 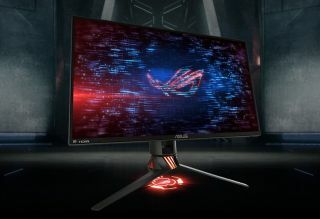 Unfortunately Asus didn't provide an exact release date or pricing information, though this is a definitely a monitor we'll be keeping our eyes peeled for. That 240Hz refresh rate is a native rating, not overclocked. The display also boasts support for Nvidia's G-Sync technology to reduce lag and eliminate screen tearing, and has an ultra-low 1ms response time. "ROG Swift PG258Q has an incredibly-fast 240Hz native refresh rate without overclocking, and is twice as fast as conventional 120Hz monitors. This results in amazingly-fluid gaming visuals with no frustrating lag or motion blur, giving gamers the upper hand in first-person shooters, racing, real-time strategy and sports titles," Asus says. The specs remain the same as when Asus first tipped this display last year. That means it's still using a Twisted Nematic (TN) panel instead of a higher quality In-Plane Switching (IPS) screen, though that doesn't come as a surprise given the focus on speed. Asus is taking aim at esports and gamers who play fast-paced action games, as opposed to someone needing a monitor with pinpoint color accuracy. This is a Full HD 1080p (1920x1080) monitor with an above average brightness rating of 400 nits. It also features a bit of ergonomic adjustments—users can adjust the height from 0 to around 120mm, pivot from 0 to 90 degrees, swivel from +50 to -50 degrees, and tilt from +20 to -5 degrees. The other thing that Asus touts here is a "frameless" design for multi-monitor setups. That's not 100 percent accurate—it has a frame, though it's pretty thin. Finally, the PG258Q has an assortment of ports, including a DisplayPort 1.2, HDMI, two USB 3.0 ports, and an earphone jack.